After the release of the new iPhone XS/XS Max/XR many people are thinking of switching to iOS but it is not so simple. If you want to switch Android to iPhone XS/XS Max/XR, you need to figure out a way to transfer all the files from your Android device to your iOS device. If you go through this process without knowing anything then you could lose your files and even damage the OS of the device. But if you read the rest of the article then you will find out about the 3 most effective ways to transfer data from one device to another. Step 1: First, you have to go to “App & Data” on your iPhone. 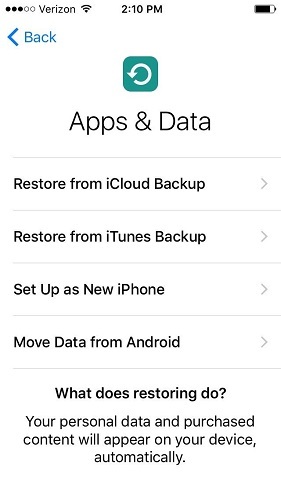 If you have already set up the new iPhone, you will need to go to Settings > General > Reset and erase everything. Step 2: then select “Move Data from Android”. Step 3: Now, go to your Android device and open Google Play Store, there you have to select “Move to iOS”. Step 4: Install the app. Step 5: After installing it, tap on “Continue”, “Agree” and “Next” on the iPhone. Step 6: Finally, you will be granted a 12 digit passcode by your iPhone XS, just put it in your Android and select the files you want to transfer. Step 7: The data transfer will start immediately after entering the passcode. If you are having trouble to use Move to iOS then simply leave it and go for the third-party option called Tenorshare iCareFone. It is a proper data transfer tool which is convenient, efficient and the interface is very user-friendly. You can easily move from Android to iPhone XS using this software but it will feature a two-part procedure. For the first part, you have to send the data from the Android device to your computer. Step 1: Get a USB cable and connect the Android device to your computer. Step 2: Then export all the files to the PC. Now, for the second part, you have to import all those files to iPhone using Tenorshare iCareFone. Step 1: Do the same and connect the iPhone XS this time after launching iCareFone. Step 2: After the connection is established go to the main interface of the software and click “Manage”. Step 3: On the next window a list will be available to you; it will be divided into 8 categories. Step 4: Now, just select any file and hit “Import”. This may be a two-part process but it is very simple and convenient for the users. This software is capable of transferring all kinds of files from iOS device including the apps. You can transfer files with USB cable without ant Wi-Fi connection. There is no risk of data loss if you use this software unlike in Move to iOS app that will erase all data and contents. More choice of file types. The file transfer is super fast. Google Drive is a cloud service developed by Google, it is very effective but it is mostly used by Android users. If you have no idea on how to transfer from Android to iPhone XS then you can use Google Drive as a medium to transfer the files. You can store 15 GB of data for free! It is a two-part procedure; here are the steps to do it. Step 1: Just go to your Android device and open Google Drive app. Step 2: Tap on the “+” button and then tap “Upload”. Now, the files you have selected from your Android device are safely stored in the Google Drive. The only thing you have to do is to download them on iPhone XS. Step 1: Open Google Drive through your iPhone. Step 2: Then, select the file and tap the 3 dots on the right. Step 3: Next tap the “Send a copy” option. Step 4: Then finally tap on “Save”. Now you know how to transfer photos from Android to iPhone XS, or for that matter any file like videos, documents, music, contacts from Android to iOS using Google Drive. All of them are very effective and safe methods to transfer Android data to iPhone XS/XR if you are switching devices. You have the official Move to iOS method then there is Google Drive and finally we have given you Tenorshare iCareFone. Each one of them will safely transfer data from one device to another but if anything seems wrong or you are having problems during the transfer then simply leave everything and use Tenorshare iCareFone. We highly recommend this amazing software!